Global Leadership & Coaching: Flourishing Under Intense Pressure at Work is a unique and personal look at coaching, leading and working internationally, bringing together inspiring, original and dramatic stories of leadership from around the world. From war zones to refugee camps, prisons to hospitals, elite sport to supermarkets, each case study draws on psychoanalytic below the surface thinking to analyse, interpret and understand a leader’s decisions, motivations and fears. Rachel Ellison’s inter-cultural approach takes us to Afghanistan, Syria and Iraq, Sudan, Somalia and the Central African Republic, to Honduras, the Czech Republic, the USA and the UK. 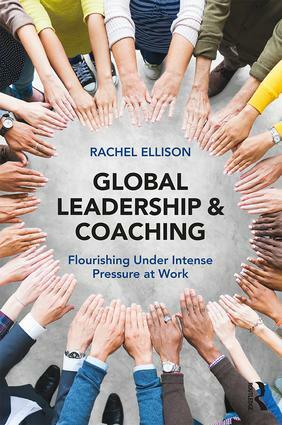 Global Leadership & Coaching presents a series of individual case studies from Ellison’s own experiences working with senior commercial, public and third sector leaders across 35 different countries, cultures and organisational contexts. Compellingly written, this book explores the a diverse range of themes to consider when managing risk, danger and extreme emotional stress in some of the most hazardous and challenging work environments. Throughout the text, leaders share their stories of learning how to lead and develop others. Accessible, engaging and original research, Global Leadership & Coaching: Flourishing Under Intense Pressure at Work is essential reading for today’s leaders and aspiring leaders looking to develop themselves personally and professionally. This book is also a resource for coaches and coach supervisors. Global Leadership & Coaching provides contemporary, practical and applicable examples of excellence in leadership, for individuals and organisations seeking to develop a high performance, reflective and reflexive corporate learning culture, which enables employees to successfully navigate challenge, increase productivity and find joy in coming to work.